I personally find the Apple watch my goto bit a tech on a daily basis. I actually own two. Now before you start thinking “what a show off” I actually didn’t buy them myself, (although I did buy my wife one) one was a gift from work colleagues and the other was given to me by Apple. I work in retail, mobile phone retail to be more precise and having the watch is such a good tool in my day to day. Being able to leave my phone “out back” but still being connected to all my notifications is invaluable. I also use it to run test calls and texts when dealing with service queries. The activity rings are always my goto benchmark to see if I have been doing enough at work. Basically if I sit down for more than five minutes I know I’m not working hard enough or motive enough to be in the right frame of mind for my customers (motion creates emotion). I honestly wouldn’t be without one. I thought that it was just my particular job and my Apple Fan boy approach to the tech that made the device so appealing; not according to Quartz. 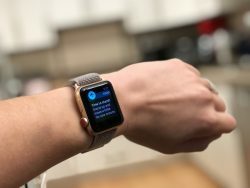 They have rightly pointed out that although the marketing for Apple Watch is currently focused on health it may be better focused on the more basic functions of the watch like notifications and communications for people that work in retail or any job where they are on their feet. When you work in retail and you are is passionate about Apple’s product there is no greater prestige than getting the opportunity to work for Apple retail. With only 20 stores in the UK jobs for the Retailer are few and far between and when living in the North East you have no opportunity’s available to you at all. Well that was until now. The only problem is that it doesn’t feel very “Apple”. When you think about buying an Apple product you want to make sure you are getting the best advise available to you and heading in to an Apple store is always the place to get it. When you live in the North East of England you have to make do with the resellers; John Lewis, Fenwick of Newcastle, Carphone Warehouse, Currys and PC World to name a few. When you buy from a reseller you don’t get the same passion in the products that you would get from individuals that work in the Apple stores. Their product knowledge is reasonable but its diluted by the volume of other products that they have to focus on. Apple staff basically, live and breathe Apple. The Apple Stores surrounding environment match the company’s passion for great design and this rubs off on every person that walks through the doors of these stores. My own passion for Apple products is so great that when a friend decided that when a job with Apple was not for them they thought of me for the role. I live in the North East of England, so with no Apple Stores to be seen; what was the job position? PC World are going to be rolling out Apple Concessions into their stores that are in locations outside of the catchment area of Apples own stores. The difference in this compared to PC World’s normal Apple product displays is that they are going to be manned by Apple employees instead of PC World staff. These “Lone Rangers” are going to be masters of their own space within the PC World stores. Their role “bring new customers to the Apple brand and increase the sale of computers to users who currently do not own a Macintosh computer and first time personal computer buyers”. I do think that this is a good move for Apple. Driving revenue and Brand awareness come hand in hand. Having a higher profile for the Apple brand can be nothing more than a good thing for Apple. These concessions will improve Brand awareness to people that may have not considered buying an Apple product. So what about my application for the job? Well, I won’t be applying. My reason for not applying despite Apple being one of the only retailers that I would consider leaving my current employer for? As one of my friends pointed out “would you take a job trying to sell fine wines in Lager World” The answer is no! Apple does have a need to increase their outlet locations but I don’t believe that this is the way to do it. People that shop at PC World, shop there because they want a bargain not quality. Apple is quality and although I see a need to encourage new people to buy the Apple brand and these concessions will help towards that; if you’re the person on the front line being paid a commission on selling a brand that you love, to a customer base that is focused on budget; it just doesn’t work. In time I do hope that this changes the PC World customer base and open their eyes to the same passion I have for Apple and its products but for now I will continue to sell Apple products the same way I always have. Sharing my passion and excitement for Apple products to encourage my friends and family to make the switch. Do you think I’m right in not applying? Would you buy an Apple product from a PC World conssesion?